A CD of all-improvisational duets between archtop guitar and trumpet is not a standard sort of offering. A rather starkly rigorous lineup of this type can be anything from mesmerizing to a raving bore. Thankfully Tooth and Nail (Clean Feed 190) falls closer to the former end of the spectrum than the latter. Joe Morris, a player who seems to enjoy increasing exposure on disk, cajoles conventional and less conventional sounds out of his microphone-captured archtop guitar while Nate Wooley, another artist getting increasing attention, plays improvisational phrases that unleash an arsenal of techniques and ideas. Morris and Wooley are exposed to our ears without the cushioning of a rhythm section, and so they face one of the more difficult challenges of the improvising artist. There are no corners to hide in; there are no other players to fill in the gaps and take center stage when the chops or ideas flag. Both Morris and Wooley show amply on this recording that they have plenty of good improvisational ideas and that their chops are up to the endurance test. It’s helter-skelter, seat-of-the-pants musical performance all the way. Generally Morris and Wooley carry on a varied and contentful dialog with a kind of paralleling double voice rather than a call and response or line and counterline discourse. In the process they enter rarefied improvisational realms. The music remains on a somewhat abstract level throughout. In that sense this is more or less a purist-modernist outing. Don’t expect quotations from “On The Trail” or “BlueTail Fly.” Perhaps this music is not for everybody. Most music isn’t. What it IS, it is consistently. It is a high-level example of advanced improvisational duets. 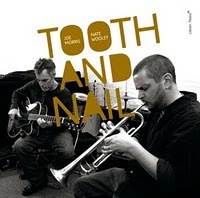 And it’s a good example of why both Joe Morris and Nate Wooley are getting so much attention lately. They gracefully carry their own weight but they also make that weight the standard by which similar ventures might be judged. In that way Tooth and Nail establishes a kind of standard measure for unconventional duet-ing.